Home » Career Management Services » Career Management Articles » The Powerful "Pause"
In my occupation as a career coach, I have provided assistance to numerous clients on professionally handling interviews and negotiating remuneration packages, as well as assisting them in all other stages of their career development and/or transition. The role of a career coach also requires the development and dissemination of resources to help client’s learn, grow and ultimately achieve their career aspirations. During my journey as a career coach not only have my clients learnt and grown, so have I. In fact, I learn every day. It is complex and detailed work, and it can take time to notice trends and links in people’s varied behaviours and reactions. Behaviours and reactions matter as their consequences immediately impacts on a person’s relationships, short and long term, plus health and wellbeing. So here is my core observation: “in general people react too quickly to events and situations without thinking through their response”. 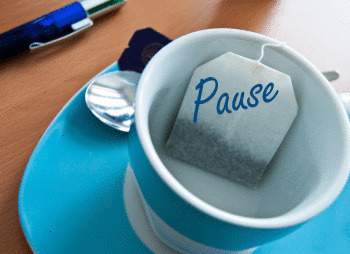 The Power of the Pause is a strong self-management tool for everyone to utilise in their career and personal lives, and powerful it is! The context of this article is the interrelationship that the Power of the Pause has with all aspects of career development, job search (and personal conduct). Preparing clients for interviews focuses on both their technical and soft skills, and indeed the ability to answer questions in a concise and informative manner. One of the tactics we coach is pausing and gathering your thoughts before giving a measured and compelling response. Another aspect of career counselling is assessing and assisting people with their emotional intelligence (EI) which is critical to participating in today’s modern workforce. The good news is that emotional intelligence can be a learned skill whereas as person’s intelligence quotient (IQ) is fixed by around nineteen years of age. So what has this to do with the above topic? PLENTY! The basis for coaching people to improve their EI is to teach them to listen and PAUSE! That’s right the POWER OF THE PAUSE again. This interrelationship is fascinating and can be ­­used as a learning and self-management tool that transforms lives, not only careers. Here it is: Power of the Pause is a fundamental tool to manage all of your personal interactions throughout your life. (Stop and think, have a coffee, go for a walk around the block or defer your response until tomorrow).